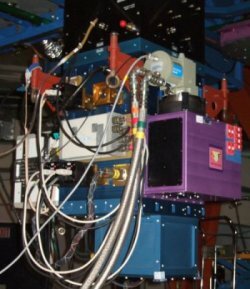 NSFCam is a 1-5 micron camera, built at the Institute for Astronomy, (IfA), for the NASA Infrared Telescope Facility (IRTF). The camera uses a 2048x2048 Hawaii 2RG detector array. The image scale is 0.04 arcsec/pixel and the field of view is 81x81 arcsec. It contains two filter wheels. The first is a 28-position wheel containing broad-band and narrow-band filters, and a wire-grid polarizer. The second contains a 1.5-5 micron CVF and neutral density filters. An external wheel containing a waveplate can be used with a polarizer in the CVF wheel for polarimetry. NSFCAM was funded by NSF. From late 2012 to early 2013, NSFCam was upgraded. The goal of the upgrade was to install a new generation H2RG engineering grade detector with an improved array controller. A 3rd generation "Leach" controller was developed to operate the new H2RG engineering grade detector. The read noise is now an order of magnitude lower than before the upgrade. In addition to work on the array, the grisms in the CVF wheel were replaced with neutral density filters. Since grism spectroscopy is now best done with SpeX, the grisms in NSFCam are no longer necessary. The optical/IR beam splitter was removed since it vignetted the beam. Recommissioning observations of NSFCam began in February 2013. Data on this web page will be updated as those results become available. Shure, Mark A.; Toomey, Douglas W.; Rayner, John T.; Onaka, Peter M.; Denault, Anthony J.